Although notoriously unreliable and not that great to drive, the DeLorean is a time-travelling icon of the 80s, and now it's been reimagined – as a hovercraft. 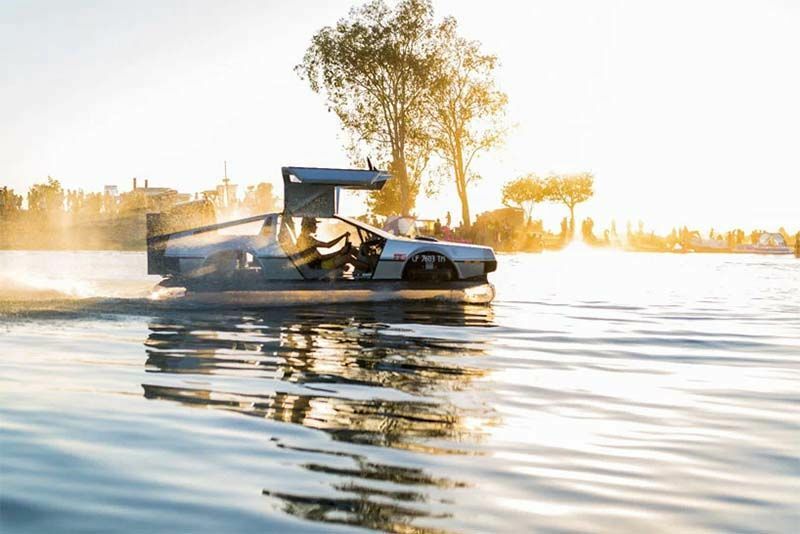 Recently, a custom-built 'DeLorean' hovercraft was listed on eBay for, what sounds like a pretty steep, US$45,000. The chap who created the stirring vehicle in the gallery above is called Matt Riese. Matt was inspired by the Back To The Future character, Doc Brown, and spent over four years building the watercraft. After launching a Kickstarter crowd-funding initiative, he managed to raise US$6,000, which helped him complete the project. Reise's eBay listing states that this isn’t just "a DeLorean bolted onto a hovercraft", rather, it's "a functional work of art". Okay then. According to Reise, he used the blueprints for the universal hovercraft UH-13PT to create the shape of the hull, clear vinyl skirt, and those large fan ducts. He then used styrofoam wrapped in fibreglass for the DeLorean body and then painted it with metallic silver paint. It's even got exciting LED lighting up the skirt. To get the hovercraft going, Reise plugged in a Briggs & Stratton Vanguard engine from a riding lawnmower, which pumps out 23-horsepower (17-kilowatt) and powers the 36-inch thrust fan. A B&S 875 Professional Series engine from a push mower drives the 24-inch lift fan. Hit the throttle and the DeLorean tops out at roughly 50km/h over water and hovers between 6 and 8 inches in the air, which means it can traverse "water, land, ice, snow, sand, dirt, whatever" – as long as it's relatively flat. All-in-all, it's pretty cool, plus, 10% of the 45 grand will be donated to the Michael J Fox Foundation for Parkinson's Disease research when it gets sold. So, if you've got some cash to burn, why not get yourself the DeLorean Hovercraft. Not only is it for a good cause but you'll be super cool. Who knows, you may even pick up the ladies. Well, those who were teenagers in the 80s at least. Video: The Faraday Future Ffzero1 Is A 1000hp Ludicrous Electric Vehicle.